When it comes to percussion, Liam Teague doesn’t just talk the talk, he gets his groove on. 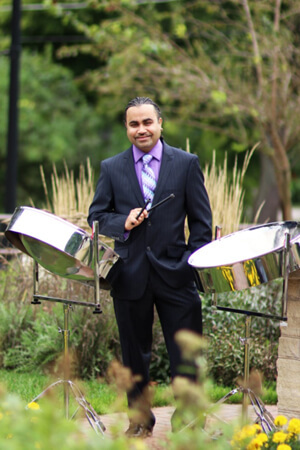 The internationally acclaimed steelpan musician and professor of music at Northern Illinois University will perform at a Faculty Recital on Nov. 18, at 6:30 p.m. at the School of Music’s Recital Hall. The steelpan is a percussion instrument where a series of dents hammered into the metal surface create a different note from the ones around it according to position and size of the dent. Teague said most people outside of the English-speaking Caribbean are not aware that the steelpan is a concert instrument that, besides playing calypso and reggae music, is equally adept at classical music, jazz and many other musical genres. Teague’s commitment to demonstrating the great musical possibilities of the steelpan has taken him to Europe, Asia, and Australia, as well as North and Central America and the Caribbean. Fellow NIU faculty musicians will join Teague during the recital that highlights new music for the steelpan and features a mix of pieces where the steelpan is played in tandem with other instruments. “I hope audience members will be exposed to the steelpan’s profundity, versatility and beauty, and will leave the concert emotionally, intellectually and spiritually stimulated,” Teague said. New compositions for the steelpan will feature fellow NIU faculty Robert Chappell (tabla), Mathias Tacke (violin), Greg Barrett (clarinet) and Faye Seeman (harp). The concert is free and all are welcome. For more information on this and other upcoming concerts, visit NIUs concert schedule.